"I'm tired of looking at the junkyard next door." What needs to be screened? There is a significant difference between screening a roadway and screening a two-story house. How tall do the trees need to be? How thick and bushy? 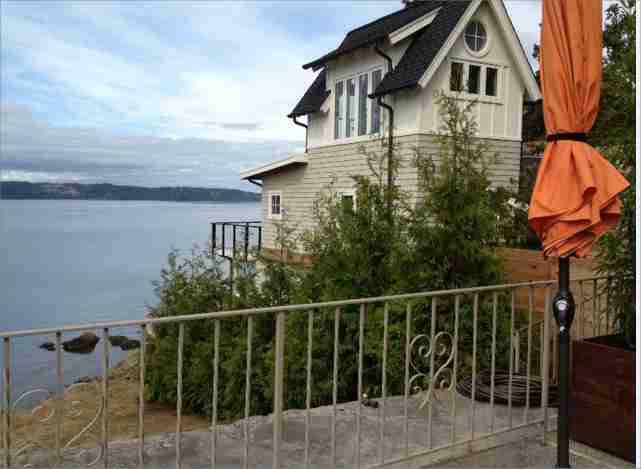 With these questions in mind, we turn to what I consider to be the “Top Ten” privacy trees in Western Washington. 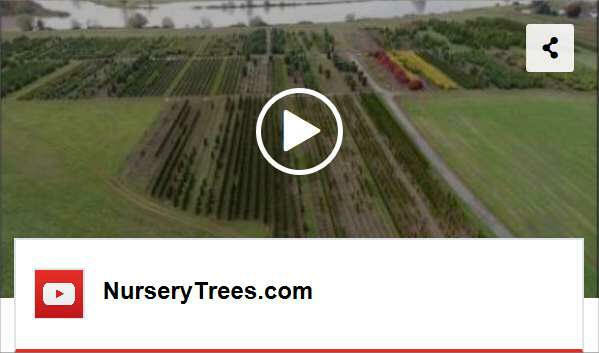 Please Note: We have a beautiful 8 minute drone video of our nursery tree farm that shows all of the trees mentioned below, growing in our fields. We suggest you watch that video at some point: Click here to go to the NurseryTrees.com's YouTube video. The trees are labeled in the video, and we’ve also given you the time on the video when each tree appears. 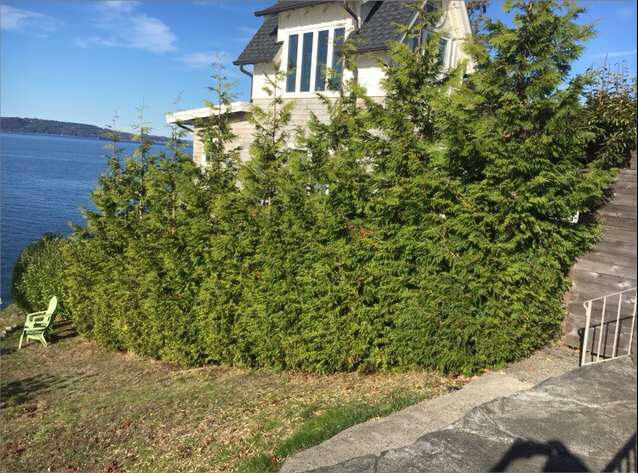 Yes, they are somewhat boring and everyone has them, but there’s a reason Emerald Green Arborvitae are the most popular privacy trees—they make a great screen. Pronounced “Ar-bor-vite-eee" (hard “i” & “e”), if you have the right growing conditions and need a narrow, full screen up to 15’ tall, you’ll want to consider these. 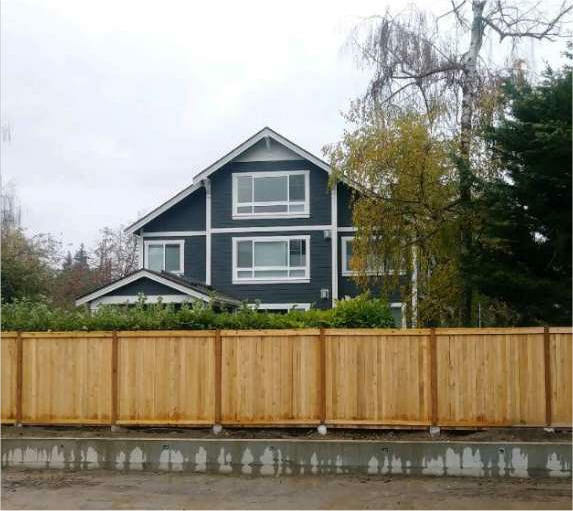 Advantages: They create a solid, low-maintenance wall which takes up only 3-4’ in your yard. They can be planted right along the border without fear of encroaching on the neighbors. They have small root systems and so can be planted closed to driveways, patios & sidewalks. Their “narrowness” preserves as much of your yard as possible. Disadvantages: Their mature height is only approximately 15’ so they won’t block off a two story house next door. They also need a lot of sunlight and well-drained soil to do well, and even in optimum conditions are slow-growing. Deer love to eat them. Webpage Link: Our Emerald Green Arborvitae webpage has more information about these trees, including Sizes & Prices. 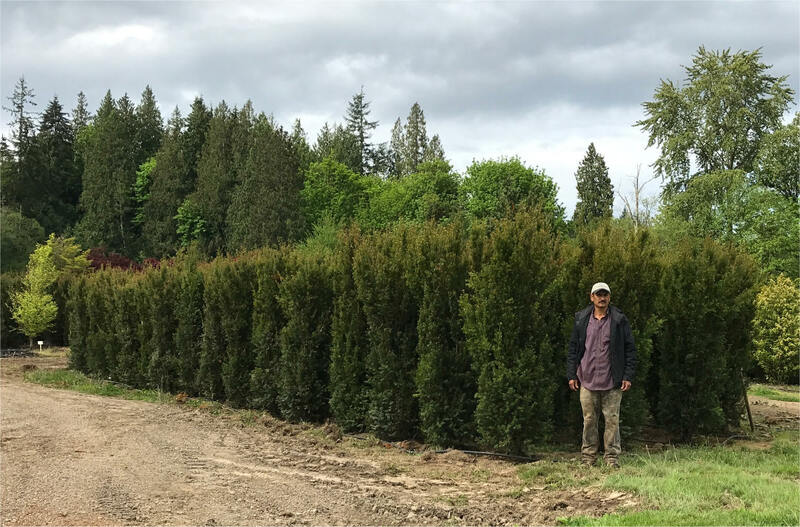 Video Note: On our beautiful video of the tree farm you will see Emerald Green Arborvitae growing in the ground, and labeled at the following "minutes:seconds": :38, :52, 1:55, 2:06. “Click Here” to be taken to that 8 minute video. 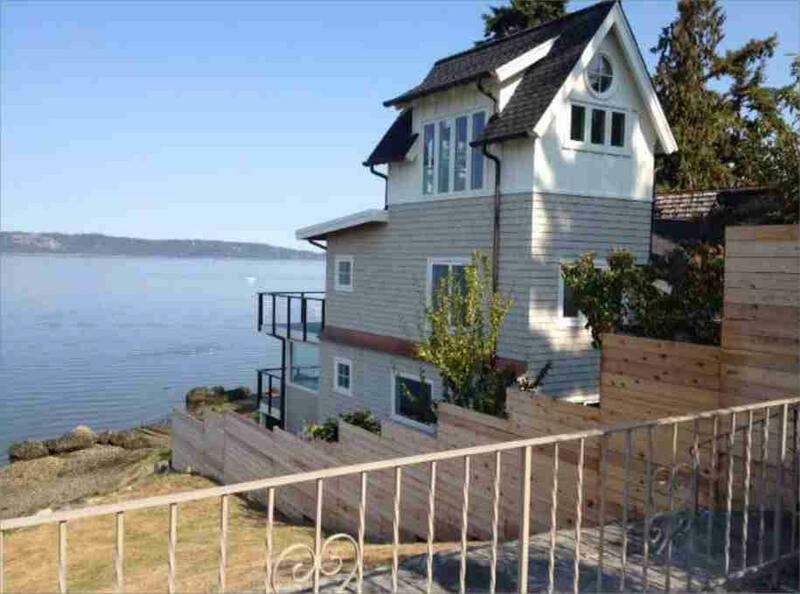 This variety of our native Western Red Cedar is often used when the Emerald Green Arborvitae isn’t tall enough or a more natural look is desired. Yet they aren’t so large as to overwhelm many planting areas. Advantages: They look great and smell good—a nice, natural cedar. They are full and bushy for screening (fuller than the standard Western Red Cedar) and can be left to grow naturally or “hedged”. They do well in a variety of soil & sunlight conditions, as you would expect for a native tree. Medium-fast growing. Disadvantages: They are a medium-sized tree, 30-35’ tall, 15’ at the base. This is too big for many urban areas. They can be “hedged” into a beautiful rectangular hedge, but that requires yearly maintenance. 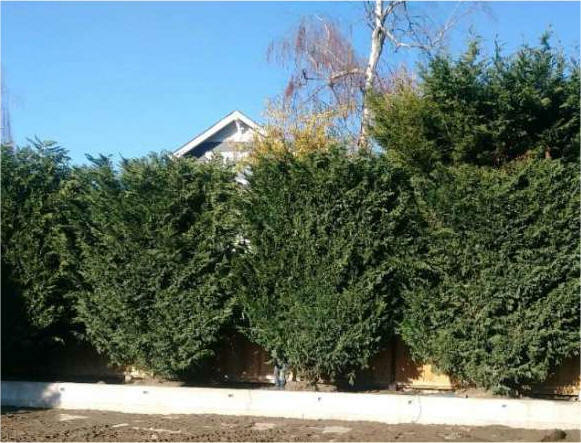 "Instant Privacy" Use: Often used when an Arborvitae is too small but a height-controlled screening tree is called for. Webpage Link: Our Excelsa Cedar Webpage has more information about these trees, including Sizes & Prices. Video Note: On our beautiful video of the tree farm you will see Excelsa Cedars growing in the ground, and labeled at the following "minutes:seconds": 2:25, 3:35, 4:10. “Click Here” to be taken to that 8 minute video. This tree has a well-known (and accurate) reputation as being the fastest-growing privacy tree. Advantages: Fast-growing. We’re not even sure that they stop growing in the wintertime. If you wish to keep control of their size they should be hedged. Disadvantages: They keep growing. People often plant these trees, excited about how fast they grow and then realize the trees are going to get much too big for the area. These trees also need good sunlight and well-drained soil and, because they are shallow-rooted, can be prone to blow over in windy areas. If they are “hedged”, the trees require significant pruning time but make a fabulously-beautiful hedge. Webpage Link: Our Leyland Cypress Webpage has more information about these trees, including Sizes & Prices. 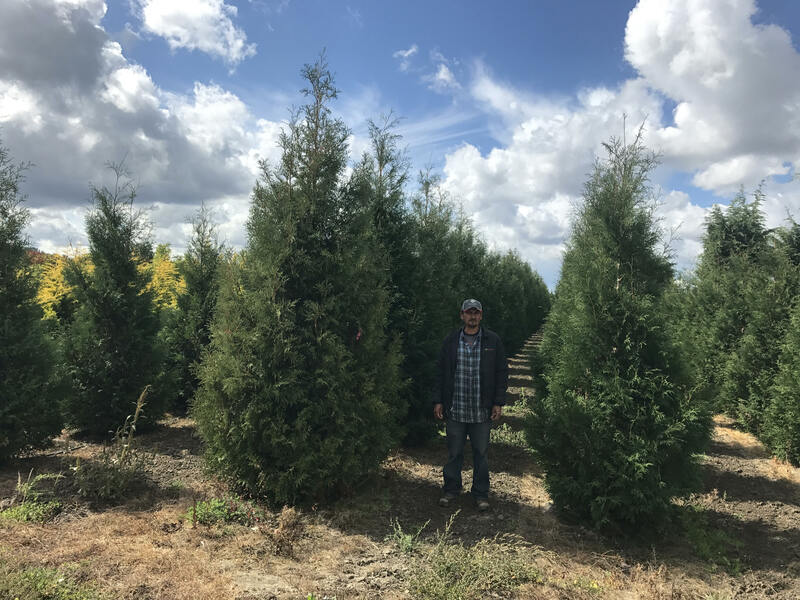 Video Note: On our beautiful video of the tree farm you will see Leyland Cypress growing in the ground, and labeled at the following "minutes:seconds": 1:20, 2:42, 3:57, and 5:14. “Click Here” to be taken to that 8 minute video. A very difficult project--3 storys to block on a slope. We're getting there. Another fast-grower, these trees are taller than the Emerald Green Arborvitae, and not as wide as the Excelsa Cedar and Leyland Cypress. Advantages: Fast-growing hybrid cedar that can handle a wide-range of growing conditions. Disadvantages: They are still somewhat wide for many yards. Like many cedars they can be sparse on top with most of the foliage on the lower half, which just moves up as it grows. Webpage Link: Our Green Giant Webpage has more information about these trees, including Sizes & Prices. Video Note: On our beautiful video of the tree farm you will see Green Giants growing in the ground, and labeled at the following "minutes:seconds": 4:47. “Click Here” to be taken to that 8 minute video. This is a privacy tree we've spent years looking for and then developing: a tree taller than the Emerald Green Arborvitae (13-15') but not as wide as the Excelsa Cedars (15') or Green Giants (12'). Introducing the "Emerald Tower tm" . You won’t find these anywhere else—we are the only nursery tree farm offering the "Emerald Tower tm" Arborvitae. This is our first crop of this exciting new privacy tree, and we are now comfortable that we know the trees well enough to sell them. 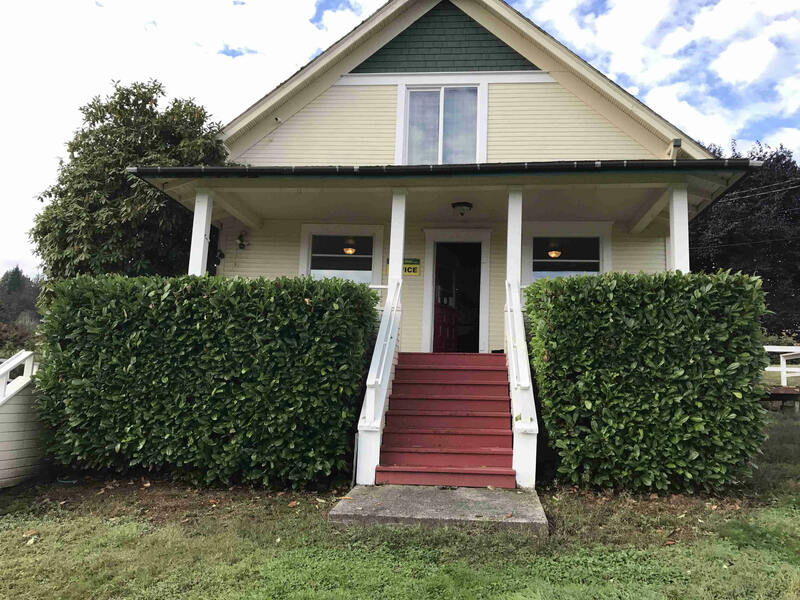 Advantages: This tree fills the gap in the “sweet-spot” of privacy trees—significantly taller than the Emerald Green Arborvitae but narrower than other trees. Plus they are full, bushy, and fast-growing. Disadvantages: Still not as narrow as an Emerald Green Arborvitae at 8’ wide (but getting there). This is our first crop of these and no one else has them—we are estimating height and width but are comfortable stating that these are columnar trees with a narrow growth habit. "Instant Privacy" Use: Often used when an Arborvitae is too small but there is a limited amount of space available for privacy trees' width. Comments: We are still learning about these trees and have not seen a full-grown one. We have noticed that in the fall/winter their coloring changes to a dark, dark green, and they can also produce noticeable quantities of brown cones. Webpage Link: Our Emerald Tower webpage has more information about these trees, including Sizes & Prices. Video Note: On our beautiful video of the tree farm you will see Emerald Towers growing in the ground, and labeled at the following "minutes:seconds": 1:10. “Click Here” to be taken to that 8 minute video. English laurel is an evergreen shrub/tree that is dense enough to make an excellent screen. It has shiny green leaves and can be shaped beautifully. It is one of two “shady area” options on my list (the other is the H.M. Eddie Yew). 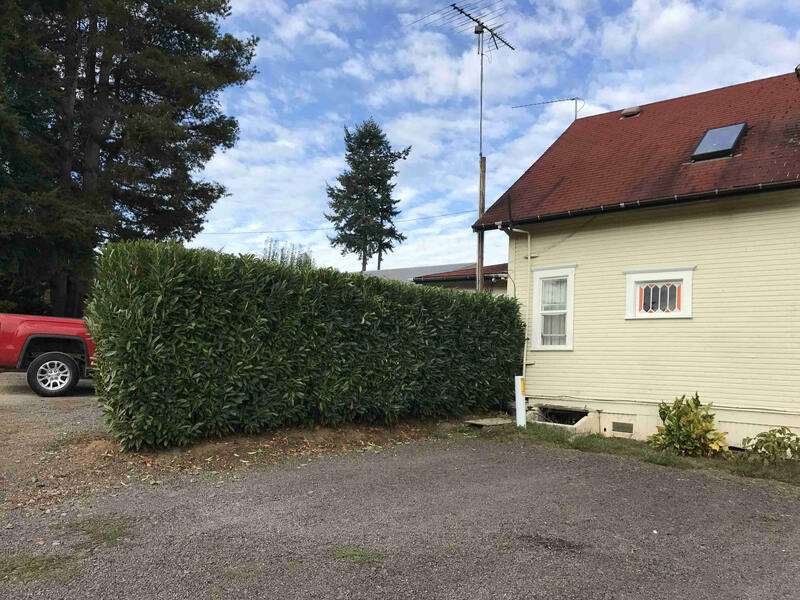 Advantages: Fast-growing evergreen that can be pruned into a beautiful hedge or left to grow naturally (if you have room). Shiny light/medium green leaves. English Laurel can grow in shadier areas than most other privacy trees. Disadvantages: If it is hedged, English Laurel needs to be pruned at least a couple of times a year; more if a finished look is desired. Also, it often reacts negatively to being transplanted—dropping leaves, yellowing foliage, and generally not looking happy. It can take some time to recover, but is a tough tree that almost always does. Webpage Link: Our English Laurel webpage has more information about these trees, including Sizes & Prices. Video Note: On our beautiful video of the tree farm you will see English Laurel growing in the ground, and labeled at the following "minutes:seconds": 1:30, 3:00. “Click Here” to be taken to that 8 minute video. Shipka Laurel at our river growing fields and "Hedged" Schipka Laurel at our farm office. Schipka Laurel is smaller and slower-growing than the English Laurel--which can be good—but still creates a lovely, full hedge. Its growth habit is more columnar than English Laurel . Advantages: A smaller laurel that is more suitable than English Laurel for most urban settings. Can be pruned into a beautiful hedge. Often used in place of the Emerald Green Arborvitae, sometimes because of lower sunlight. Disadvantages: None, as long as 12’ tall and 6’ wide is sufficient for screening. 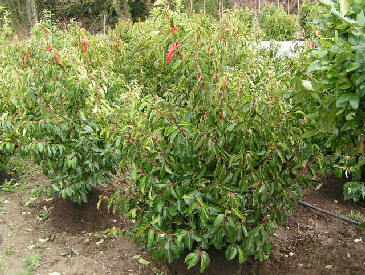 Webpage Link: Our Schipka Laurel webpage has more information about these trees, including Sizes & Prices. Video Note: On our beautiful video of the tree farm you will see Schipka Laurel growing in the ground, and labeled at the following "minutes:seconds": 3:16, 4:24. “Click Here” to be taken to that 8 minute video. H.M. Eddie Yews at our farm. "H.M. Eddie” Yews are a great alternative to “Emerald Green” Arborvitae for shady planting locations. They have the same, columnar growth habit as the Emerald Green" Arborvitae, but they are much more shade tolerant. Advantages: A low-sunlight alternative to the Emerald Green Arborvitae. Like the Arborvitae they don’t take up much space in the yard yet will create a solid wall. Disadvantages: Upward branching structure and flat top makes the susceptible to snow damage. This can be lessened by tying them periodically. Webpage Link: Our H.M. Eddie Yew webpage has more information about these trees, including Sizes & Prices. "Gold Rider" Leyland Cypress at our farm office. ‘Gold Rider’ Leyland Cypress is a variety that will mature at about half the size of the "regular" Leyland Cypress and is not nearly as fast-growing. 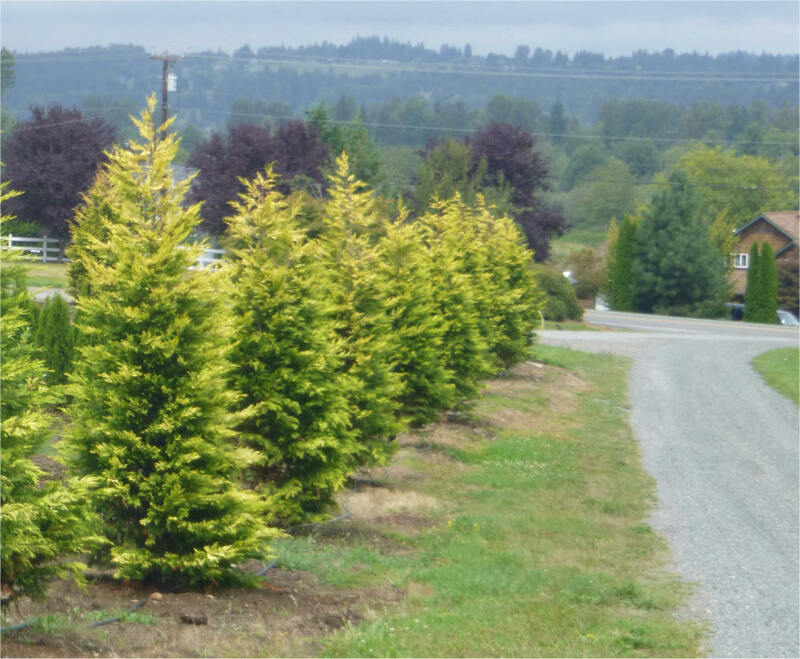 ‘Gold Rider ‘ Cypress has beautiful golden foliage that makes a stunning hedge or stand-alone specimen tree. The yellow color is concentrated at the branch tips, that gives a “two-toned” effect with the green interior foliage. Advantages: Color, color, color; everything else on this Top 10 list is green. Use as a colorful alternative to Emerald Green Arborvitae, Excelsa Cedars or Green Giants. Disadvantages: These trees need full sun or something close to it to fully bring out the gold color (and wherever they are planted they are more colorful in summer than in winter). We are estimating the mature height of these trees because we haven’t seen a full-grown one and available information conflicts. Webpage Link: Our Gold Rider Cypress webpage has more information about these trees, including Sizes & Prices. Video Note: On our beautiful video of the tree farm you will see Gold Rider Cypress growing in the ground, and labeled at the following "minutes:seconds": 1:05. “Click Here” to be taken to that 8 minute video. Portugal Laurel is an easy to grow, densely branched shrub, with glossy green leaves that are reddish when young. Advantages: A medium-sized laurel that can make a good screen, hedged or natural. 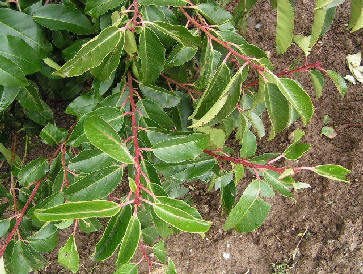 Disadvantages: It is just a matter of taste—Portugal Laural has a different look, with curved leaves that some people don’t like and other people really like. We sell a lot more English Laurel and Schipka Laurel than we do Portugal. 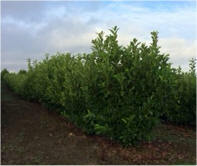 Webpage Link: Our Portugal Laurel webpage has more information about these trees, including Sizes & Prices. Besides growing these trees, we can deliver and plant them for you. We offer free, no-obligation estimates. 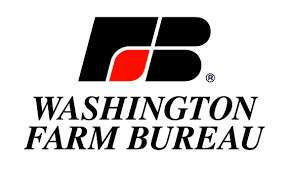 To begin the discussions we ask that you please fill-out our online "Request a Free Estimate" Form. This basic information helps us to get things organized, assign your project a number, and we work with you from there to define your tree options and then give you a Price Quote(s). We may send out one of our tree experts to take a look at your project with you (also no cost or obligation). Project Worksheets are handled on a first-come, first-served basis. We have a “Privacy Tree Comparison Chart” that allows you to quickly compare basic information about the privacy trees mentioned abovce. We can deliver & plant our privacy trees for you. Click here for more information about these services. You can also see more “Before & After” photos in our Photo Gallery. 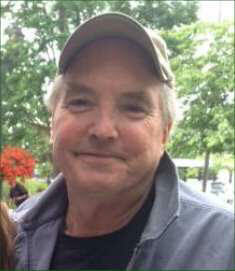 Michael S. Gillie is the Manager of NurseryTrees.com, LLC, a nursery tree farm in Snohomish County that he founded in 1995. 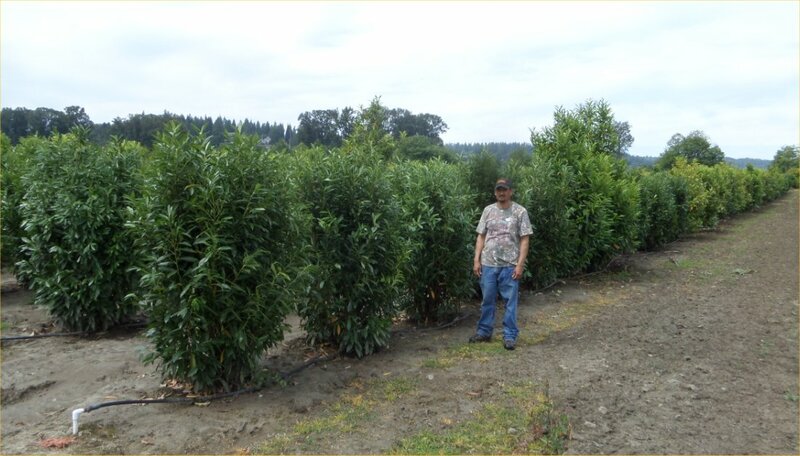 He and NurseryTrees.com staff have many years’ experience growing and planting privacy trees, including experimenting with new trees and special pruning. For further information please see the About Us section of our website. We deliver and plant these trees. 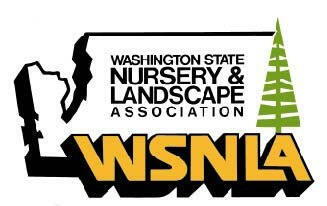 Most of our planting projects are in Western Washington: Blaine, Bellingham, Everett, Mukilteo, Bothell, Edmonds, Shoreline, Seattle & the "East Side"-- Bellevue, Kirkland, Redmond, Sammamish, Issaquah, etc.--Renton, Federal Way, Tacoma, south to Olympia and all points in between; plus Leavenworth & Wentachee. Further away, people often come pick up the trees here at the nursery and arrange for local planting. Please see the "Advantages" section below for more information about our planting services and our company.